Belize, 10 Reasons to Explore the Sea & Inland! If you’re planning a beach vacation in Belize, be forewarned: There’s a good chance you’ll never want to leave your perfect stretch of sand. And that would be fine, except that there are so many reasons to do just that. Fantastic Maya ruins, exotic wildlife, impressive caves, and the world’s second-largest barrier reef are all just a day or half-day trip away from some of Belize’s most popular beach destinations and are well worth a visit. Below is a round-up of fun (and convenient) trips that you can take using top coastal spots as your base. Choose what strikes your fancy, then get out and explore. We promise: The beach and that cold bottle of Belikin will be there when you get back. Travel by boat and bus to the Lamanai ruins, one of northern Belize’s most fascinating archaeological sites. 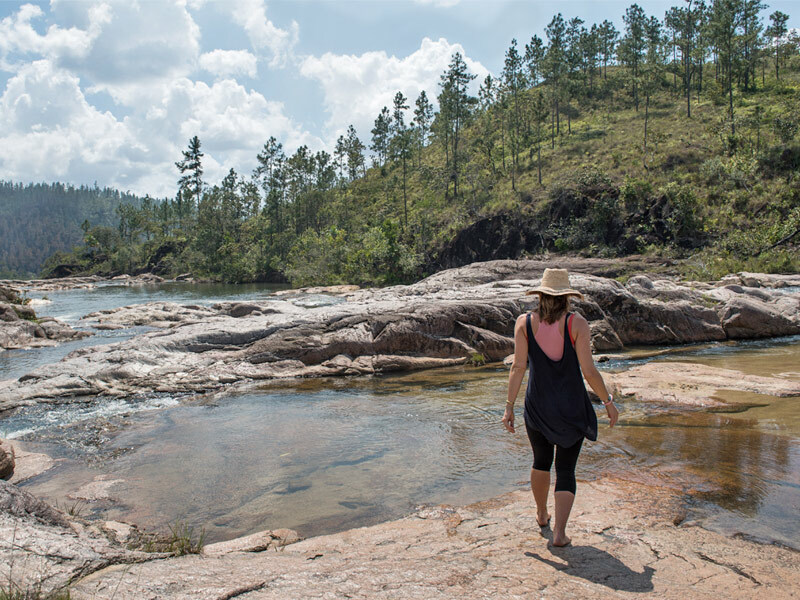 Accessed via the New River (itself a stunning natural attraction that serves as a magnet for birds, monkeys, crocodiles, and tons of other wildlife), Lamanai is home to incredible pyramids, plazas, and beautiful carvings and sits in a rich jungle setting. It was one of the longest occupied sites of the ancient Maya world and has endless stories to tell. Head southeast into the rugged Toledo District to explore one of two Maya ruins: Nim Li Punit, a former political and religious hub with more than two dozen stelae (including the second-tallest in the Maya world), or Lubaantun, an ancient administrative center notable for its unusual mortar-less, black slate construction and ceramic figurines. Once you’ve had your fill of archaeology, you’ll visit a nearby cave where you can hop on inner tubes and take a leisurely river ride past stalactites and stalagmites. Head to the Community Baboon Sanctuary (CBS), a fascinating conservation project that aims to preserve the natural habitat of black howler monkeys (called “baboons” in the local Creole dialect) and promote the economic development of participating communities. In addition to learning more about CBS’s work, you’ll have the opportunity to get up close and personal with the monkeys. After lunch, you’ll continue to the Maya site of Altun Ha, an ancient ceremonial center and trade hub that linked the Caribbean with Maya towns in the interior. This tour is best done to/from the Belize City airport. Take a short cruise up the jungle-lined Monkey River, an area that’s home to crocodiles, iguanas, turtles, toucans, herons, and, of course, monkeys (howler monkeys, to be precise). Set out on a moderate, 40-minute hike to learn about the forest and spot additional wildlife before exploring the small Monkey River village, too. A leisurely return by boat takes you along the Placencia Lagoon, home to mangrove estuaries where you can spot the occasional manatee or dolphin. Established in 1983 as a last ditch effort to house a collection of wild animals used to make a documentary on tropical forests, the Belize Zoo provides a home to more than 150 native animals that have been orphaned, rescued, rehabilitated, donated, or born on-premise. Situated on a 12-hectare (29-acre) stretch of tropical savannah, the zoo is an excellent way to see elusive animals you might not otherwise (like jaguars) and to learn about the country’s myriad natural habitats. This tour is best done to/from the Belize City airport. Want to get an up-close look at a stingray or shark? Hol Chan Marine Reserve in Belize provides the opportunity for just that. Located near the southern tip of Ambergris Caye, this 17-square-kilometer (6.5-square-mile) reserve is home to the famous Shark Ray Alley, an area of sea grass that provides natural habitat for nurse sharks and southern stingrays, alongside of which snorkelers can swim. A narrow channel in the reserve cuts through a shallow but rich coral reef that’s also home to incredible sea life, including moray eels and black groupers. Every year, from April to June, whale sharks (the world’s largest fish) appear off the coast of Placencia, near Gladden Spit, to feed on spawning fish. Reaching up to 12-meters (40-feet) long, these mellow giants are curious and gentle around people. Whale sharks are most commonly spotted in the evening and around the time of a full moon. Tours to see them usually accommodate both snorkelers and scuba divers. Belize is an angler’s paradise, and both Ambergris Caye and Placencia offer excellent opportunities to hook the big one. On Ambergris, you’ll find flats fishing, reef fishing, and deep sea fishing. Near Placencia, expect a variety of reef and off-shore fishing experiences, too. Set out on full or half-day tours from either destination to catch bonefish, permit, tarpon, snapper, grouper, sailfish, marlin, and more. Get ready for a day of spectacular diving. Travel to the Blue Hole Natural Monument, a 122-meter (400-foot) deep sea cave adorned with stalactites that’s home to reef sharks and the occasional hammerhead. Afterward, set out for the waters of Half Moon Caye (here, along the “wall,” you’ll see a variety of incredible coral formations) before enjoying a picnic on the island’s sandy shores and exploring its red-footed booby sanctuary. You’ll then enjoy your last dive at the appropriately named Aquarium, home to a tremendous variety of fish. The Belize barrier reef sits between 30 minutes and one-hour away from Placencia by boat, dependent on your destination. Top spots for snorkelers vary due to weather conditions and guest preference, but popular places include Laughing Bird Caye (a national park), Silk Cayes, Ranguana Caye, and Pompion Caye. If you’re setting out from Ambergris, plan a snorkel tour (and beach barbecue) along the island’s northern coast. You’ll head first to Mexico Rocks (look out for hermit crabs and conch) and then to Robles Point, where a pristine beach practically touches an excellent section of snorkel-able reef. Enjoy a barbecued lunch before heading to your last snorkel spot, the amazing Basil Jones, home to lobster and rays.